Our Heavy Duty Bull Grinder includes a powerful 1HP to provide you with maintenance free years. This provides you with the essential function to grind meat at a swift pace without crushing or mashing the product. Meat products will only contact the High Quality Stainless Steel Surfaces to ensure cleanliness as well as safety. The bowl assembly and feeding tray can be Easily Removed and Cleaned without the inconvenience of using tools. The stainless steel bowl assembly also includes a Safety Opening Function to decrease the possibility of acquiring any injuries to the staff. Conforms to all Safety Regulations. Another ideal advantage is the Reverse Switch. This special feature is intended to maximize productivity by Reducing Operator Fatigue and Discomfort. 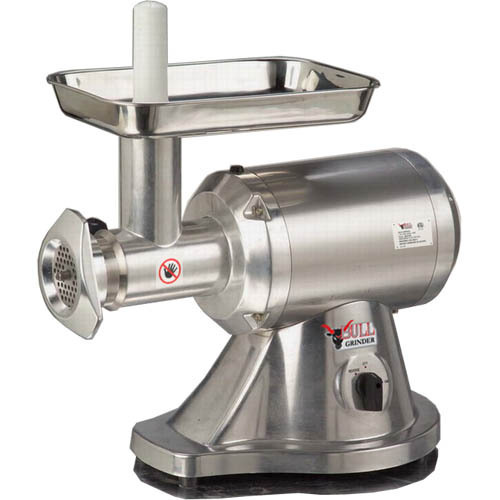 Bull Grinder provides superior performance to handle most tough meat and food grinding jobs. Also this heavy-duty machine grinds up to 9 to 14 lbs per minute. Dimension(WxDxH) : 9" x 17" x 16"